We’d love your help. Let us know what’s wrong with this preview of Silent Invasion by Clive Hamilton. In 2008 Clive Hamilton was at Parliament House in Canberra when the Beijing Olympic torch relay passed through. He watched in bewilderment as a small pro-Tibet protest was overrun by thousands of angry Chinese students. Where did they come from? Why were they so aggressive? And what gave them the right to shut down others exercising their democratic right to protest? The a In 2008 Clive Hamilton was at Parliament House in Canberra when the Beijing Olympic torch relay passed through. He watched in bewilderment as a small pro-Tibet protest was overrun by thousands of angry Chinese students. Where did they come from? Why were they so aggressive? And what gave them the right to shut down others exercising their democratic right to protest? The authorities did nothing about it, and what he saw stayed with him. In 2016 it was revealed that wealthy Chinese businessmen linked to the Chinese Communist Party had become the largest donors to both major political parties. Hamilton realised something big was happening, and decided to investigate the Chinese government’s influence in Australia. What he found shocked him. From politics to culture, real estate to agriculture, universities to unions, and even in our primary schools, he uncovered compelling evidence of the Chinese Communist Party’s infiltration of Australia. Sophisticated influence operations target Australia’s elites, and parts of the large Chinese-Australian diaspora have been mobilised to buy access to politicians, limit academic freedom, intimidate critics, collect information for Chinese intelligence agencies, and protest in the streets against Australian government policy. It’s no exaggeration to say the Chinese Communist Party and Australian democracy are on a collision course. The CCP is determined to win, while Australia looks the other way. To ask other readers questions about Silent Invasion, please sign up. When I was in primary school and aged about 11 (circa 2000), we would travel to Melbourne for school excursions to places like the zoo and the Holocaust museum (gotta gettem while they're young, right?). A game we used to play on the bus through parts of Melbourne as innocent kids was called 'spot the Aussie' - all you had to do was spot the Caucasian amongst the sea of Asians. There was no malice in the game, just kids being kids. As the years have rolled on, the subject of immigration to Austr When I was in primary school and aged about 11 (circa 2000), we would travel to Melbourne for school excursions to places like the zoo and the Holocaust museum (gotta gettem while they're young, right?). A game we used to play on the bus through parts of Melbourne as innocent kids was called 'spot the Aussie' - all you had to do was spot the Caucasian amongst the sea of Asians. There was no malice in the game, just kids being kids. As the years have rolled on, the subject of immigration to Australia has become a polarising one, particularly when it comes to the Chinese. Hamilton, in this dense and well researched book, does a great job in exposing how deep Chinese influence runs in Australia and just how lacking of a spine Australia's politicians are. Someone quotes in the book that 'money talks, and it speaks Mandarin' when it comes to politicians and people of influence within Australia. Silent Invasion deals with most of the problems that arise with the heavy amounts of Chinese immigration that are currently occurring - from Australian businesses being bought up, policies changing to reflect Beijing's, history revisionism by the Chinese (did you know that the Chinese actually discovered and colonised Australia in 1432 according to the Chinese Communist Party?! ), the negative effect on the Australian housing market, communist infiltration into the intellectual academies, the degradation of Australia's defence system and basically how quickly and deeply those loyal to China first have become prominent in Australian society. An alarming look at Beijing’s influence in Australia, particularly of geoeconomics, how any nation angering the Chinese government has been responded by swift and damaging sanctions. Most importantly it presents researched, factual findings, and is not a book riddled with sensationalism as I thought before reading it. 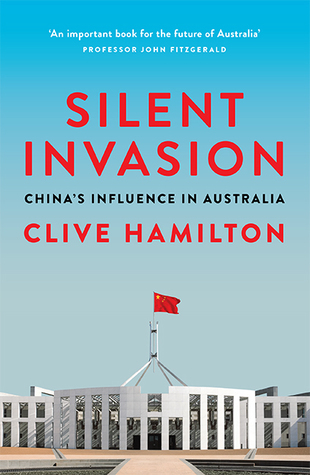 Having met Clive Hamilton, read his books and having a great respect for The Australia Institute, I was curious why he would stick his neck out and write a book so controversial that would make him open to being labelled a racist or anti-Chinese. Hamilton is a brave person who will speak out and he has in this well researched book. There is nothing in this book that is not supported by ample evidence. I read this book with one marker in the Notes and one book mark to my current page. Australian Having met Clive Hamilton, read his books and having a great respect for The Australia Institute, I was curious why he would stick his neck out and write a book so controversial that would make him open to being labelled a racist or anti-Chinese. Hamilton is a brave person who will speak out and he has in this well researched book. There is nothing in this book that is not supported by ample evidence. I read this book with one marker in the Notes and one book mark to my current page. Australian are shown to be naive, easily bought and have a short term outlook. The example of Andrew Robb comes up in the book. Andrew Robb was Australia's minister for Trade and Investment and was involved in negotiating trade deals with other countries including China. These deals, negotiated for Australians were, however, highly secret until they were a fait accompli . Why, I asked many times, are the people who will be affected by this, not allowed to know what is being agreed to? Funny! Less funny is that he then retired and went straight away to work for Landbridge, the current owners of the Port of Darwin. Obviously a conflict of interest issue but Robb got away with it. Other examples of politicians being bought. Sam Dastyari comes to mind. Hamilton takes the reader through many ways that the Chinese government is infiltrating our industries, buying up assets, farming lands and spying and stealing our IP, yet the average Australian either does not know or is scared of speaking out. Food for thought indeed and so glad Hamilton wrote this book. A very interesting book that raises many worrying things that are happening in Australia. Several of the episodes are publicly known but much more is not and politicians and the media are mostly quiet about the situation. This is a very frustrating book. Clive Hamilton discusses some very serious issues about China's relationship with Australia, issues that need to be discussed and addressed. But he undercuts his argument with rather tiresome name-calling (anyone who would take a different view to him is a member of the "China lobby", a "dupe", an "apologist" and so on) and other tropes that reek of the harangue, including the unsourced ascription of motivation to people who do or say things with which he disagre This is a very frustrating book. Clive Hamilton discusses some very serious issues about China's relationship with Australia, issues that need to be discussed and addressed. But he undercuts his argument with rather tiresome name-calling (anyone who would take a different view to him is a member of the "China lobby", a "dupe", an "apologist" and so on) and other tropes that reek of the harangue, including the unsourced ascription of motivation to people who do or say things with which he disagrees. He also makes the occasional but telling error of fact, judgement or interpretation due to his reliance on interpreters and informants for understanding aspects of Chinese culture, society and politics. If you were going to write about China's political and economic influence on another country, you would want to get your facts straight and that is what Hamilton sets out to do. Every claim is meticulously referenced so much so that the book becomes a list of well documented facts and as such is not a particularly satisfying read. What it does do well is offers a deeply unsettling and detailed train of evidence of China's 'One hundred year' strategy and Australia's part in ensuring global superi If you were going to write about China's political and economic influence on another country, you would want to get your facts straight and that is what Hamilton sets out to do. Every claim is meticulously referenced so much so that the book becomes a list of well documented facts and as such is not a particularly satisfying read. What it does do well is offers a deeply unsettling and detailed train of evidence of China's 'One hundred year' strategy and Australia's part in ensuring global superiority by 2050. A phenomenal, well-researched account of the rising influence of the Peoples Republic of China upon Australia. The book explores the entangled web that the Communist Party has spun across Australia's cultural institutions, former and current leaders, universities, media and the CSIRO. Excellent book - 5 stars. It gives good overview and lots of examples how communist party runs china foreign policy and foreign investments to other countries. Handbook of behaviour what to expect in Europe soon (or already happenening). Shows how much China influence has been increased in Asia and how countries consider to hedge declining US power there. Must read. Australian elites have let the country down - either greed or denial/ignorance. The book is a Must Read for all Australians. Well researched, well written, if this isn't a wake up call for politicians, universities, the Defence Force and media then I don't know what is. I was driven to read this novel on the back of the reports that various publishers were refusing to publish the novel out of (alleged) fear of a back lash from Beijing. It is definitely one of the most politically contentious novels I have read but it covers an area that many Australians are afraid to explore due to the threat of being called a racist. Clive Hamilton does a comprehensive job in analysing the reach of the Chinese state into Australian domestic matters. While some of the revelatio I was driven to read this novel on the back of the reports that various publishers were refusing to publish the novel out of (alleged) fear of a back lash from Beijing. It is definitely one of the most politically contentious novels I have read but it covers an area that many Australians are afraid to explore due to the threat of being called a racist. Clive Hamilton does a comprehensive job in analysing the reach of the Chinese state into Australian domestic matters. While some of the revelations in the novel are shocking, there is a fair bit of hearsay (rather than documented evidence) used to support those claims. Independent of some of the scrappy lines of evidence and borderline racist commentary, it is clear that the reach of Chinese state in Australia goes from the grass root Chinese communities all the way to academia and the political parties. Beijing is not just content to set up these networks, since it sees Australia as part of its sphere of influence, but is actively exploiting it to pursue their own usually obscured geopolitical aspirations. A very interesting insight into the influence that the CCP has over its citizens and how it is trying to influence the two nations that are weakened (Australia and New Zealand) by geography. It is also interesting the narrative the CCP is trying to force onto the Australian population. There was an interesting comment made about that Chinese students take the slightest offence at something and think its an attack on the motherland and it can whip up a 'jingoistic fervour' in them. As well as how A very interesting insight into the influence that the CCP has over its citizens and how it is trying to influence the two nations that are weakened (Australia and New Zealand) by geography. It is also interesting the narrative the CCP is trying to force onto the Australian population. There was an interesting comment made about that Chinese students take the slightest offence at something and think its an attack on the motherland and it can whip up a 'jingoistic fervour' in them. As well as how fast Chinese students can be mobilised for the state or how fast they can be punished for comments made against the CCP. This book is a hair-raiser. The author did a good job investigating and reporting the infiltration from China to Australia. The original publishing company withdrew to publish this book is very telling that the influence of China is very strong. The freedom of speech in Australia is being sabotaged. Great insight into how some of the apparent benign actions of big Chinese powerhouses **can** have some more sinister side effects on the Australian lifestyle and culture. Some political bias but definitely worth a read. Well researched and important work, but often appears to jump on the "Has a Chinese name, could work for China" angle a little too easily. I have plenty of Chinese friends, with very Chinese names, who would never work for the Communist Party no matter their threats. Some parts, though necessary, are quite boring but overall it is a compelling read to understand the way the CCP is an organisation to treat with great care. A lot can be lost to it only by sheer ignorance. An interesting book about how China uses its money to influence Australia which covers students, Chinese community, and politicians. This is a very disturbing book. Aussies are far too naive and complacent for their own good, and are very poorly led. Wake up, lest you lose your country and not even know what happened. Interesting. I guess you really want to be clear about the all encompassing references to the ‘Chinese’ in this book; the author does emphasize he was concerned about the Chinese Communist Party’s strategies, and not so much the Chinese people. You don’t want racial prejudice erupting and damaging people. It is ok to look at one countries strategies to get ahead and critically consider these. All countries are vying for power and to further expand their own interests. Hamilton is a bit more urge Interesting. I guess you really want to be clear about the all encompassing references to the ‘Chinese’ in this book; the author does emphasize he was concerned about the Chinese Communist Party’s strategies, and not so much the Chinese people. You don’t want racial prejudice erupting and damaging people. Hamilton is a bit more urgent about China’s strategies, feels we’ve been bought and conned, wined and dined. And infiltrated. I don’t know. This is a fact-heavy book (with detailed source references), which sets out an argument for why Australia should be more vigilant with regards the potential for China to influence Australia. It is a compelling read, though a little repetitive at times. The structure is neither chronological nor clearly aligned to chapter headings. Recommended for those who are interested in this topic, as well as those who have not yet studied the topic. Good insight into how China's soft power and diplomacy is being deployed into Australian institutions and power structures. A controversial book as some publishers refused to publish it which was why it was interesting to read. Very interesting book with a lot to consider. One of the reason I read it was due to the efforts in trying not to publish it. A bit of a wake up call before we sell off the farm. Free Tibet! Eye-opening. Deeply disturbing, and quite scary. Clive Hamilton AM FRSA is an Australian public intellectual and Professor of Public Ethics at the Centre for Applied Philosophy and Public Ethics and the Vice-Chancellor's Chair in Public Ethics at Charles Sturt University. He is a member of the Board of the Climate Change Authority of the Australian Government, and is the Founder and former Executive Director of The Australia Institute. He regula Clive Hamilton AM FRSA is an Australian public intellectual and Professor of Public Ethics at the Centre for Applied Philosophy and Public Ethics and the Vice-Chancellor's Chair in Public Ethics at Charles Sturt University. He is a member of the Board of the Climate Change Authority of the Australian Government, and is the Founder and former Executive Director of The Australia Institute. He regularly appears in the Australian media and contributes to public policy debates. Hamilton was granted the award of Member of the Order of Australia on 8 June 2009 for "service to public debate and policy development, particularly in the fields of climate change, sustainability and societal trends".